I blogged about apples yesterday, but I couldn't help but notice the size of the British Braeburn apples in my local supermarket yesterday. They are enormous! But when the shop assistant suggested I could always 'share one with a friend', then that was a big turn-off for me. I'm not great at sharing my food! It seems that the late sharp Spring frosts in the UK have swelled the size of the Braeburns to nearly three times there usual size. Normally weighing about 160g, they are now arriving at our stores at 450g a piece. Cold weather in late April killed off many of the apple buds in the orchards of Britain, meaning there were fewer fruit, which swelled on the tree through the extra nutrients and extra water. (I always heavily cull my apple trees in the Spring to get larger cooking apples for Mrs Real to put into her apple pies). It was surprising yesterday to see such giant fruit in Morrisons supermarket, as in the past such big apples might be considered too large for stores that refuse to take fruit and vegetables failing to meet some 'imaginary' standards for shape, size and colour. However, Morrisons do sell bags of 'wonky onions' and appear to have relaxed their restrictions on fresh produce, in order to appear to address the growing need to reduce food waste. I tasted one of these giant Braeburns yesterday, and they do taste as good as a smaller one, sadly a whole apple was just too much for one person. If unlike me, you are happy to share your apple, then get down to your local Morrisons store. Sadly, I only grow cooking apples in my own orchard, but I will think about an 'eater tree' next year. 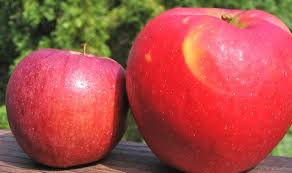 While Braeburn is a great eating apple, I do like Gala apples, the most popular apple sold in the UK. On occasions, it can taste a little 'woolly' in texture, and then it's a Pink Lady that gets selected for the fruit bowl in the kitchen. I salute a fellow apple aficionado. If you want to use my photo, would please credit my blog, and link to it? My work is not in the public domain. Thanks!